In 2015, we started working on understanding mTOR, the target of several FDA approved inhibitors for Kidney Cancer. mTOR is responsible for regulating cell growth and metabolism, integratingsignaling from a number of other genes that are commonly mutated in many other cancer types as well. mTOR itself is most commonly mutated in Kidney Cancer, but is also mutated in 2% of all other cancer types, potentially affecting millions of patients! Projects 10491-10499 aim to help understand the effect these mutations, observed in the clinic, have on the structure and regulation of the protein. Understanding these mutants can provide a framework to understand which patients will respond to mTOR inhibitors already approved, and which mutants are best targeted by new drug development efforts. The X-ray crystal structure of mTOR that projects 10491-10499 are based one. 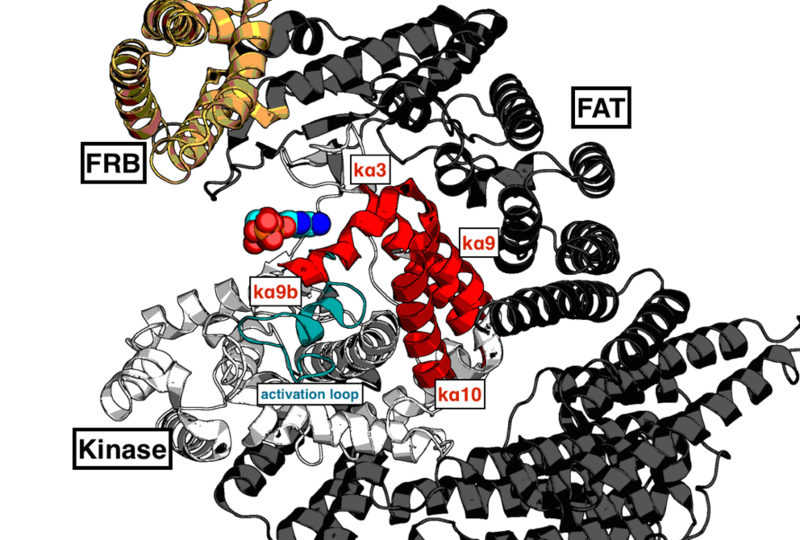 The three major domains (Kinase, FAT and FRB) are highlighted in white, black and gold respectively. Key features of the kinase domain are shown in red and blue, with ATP shown in spheres representation.